Yesterday while out (local thankfully) on my friends BMW K100LT (long term loan) I noticed a clutch problem, the clutch did not disengage when the lever was pulled in. It was sudden. I was at the local engineers so I wheeled it into his workshop (out of the 44C sun), adjusted the clutch cable, checked the gearbox oil and added a little BMW approved gear oil and rode off, still with the clutch failing to fully disengage when pulling the lever in regardless of adjustment. I had contacted the owner who said "drop into the local bike shop, they know my bike and I'll look after it. I got half way to the bike shop and lost drive to the rear wheel after I stopped at an intersection. I had carefully changed gears with no clunks and put it into neutral as soon as I stopped at the intersection. I put it into first and all that happened was a weird whirring of gears but absolutely no drive to the rear wheel. I pushed the bike up the hill, over the bridge into a local off street establishment where the owner has bikes and arranged to leave it in his lockable car park till the bike shop could get to it (after near dropping dead from pushing the monster up hill in 44C temps while wearing jacket, helmet, gloves and boots).. I've searched and came up with the possibility of it being the clutch spines or the drive shaft splines or one of 100 other spline problems within the gearbox/drive system. Apparently these things need the splines lubricated on a regular basis which I'm sure my friend and owner of loan BMW wouldn't know, he lets the local thieves in the shop do what they think needs doing (he's a science teacher at the local high school and doesn't have the time to get to it to do anythin and rarely rides the machine). Welcome to the forum Leo. I don't have a K100LT but other than it being a cable actuated clutch rather than a hydraulic as in my K1200LT, it is pretty much the same. Likely it will need to be disassembled to find the cause but with the clutch not disengaging fully before completely failing, it almost sounds like the clutch disk disintegrated. I am not sure if stripping clutch splines would prevent the clutch from disengaging although if it was jammed as it was over running the splines, it may drag some on one plate or the other and not float before it fully stripped them out so I suppose that is possible. If it lost drive in all gears, the issue is pretty much localized to the clutch pack area, spline or disk disintegration as I don't think anything else would affect the clutch operation itself such as you describe with not fully disengaging. Leo_G and milwbeemer like this. Clutch adjustment for early K bikes. If the part on the gear box is off, the adjustment on the handle bar may not get it good enough .. Since as the clutch wears, the push rod gets effectively longer ( extends further out), the effect would be the clutch would start to slip not fail to fully disengage and then completely fail to connect. Don't think that fits this situation. I haven't gotten to see whether the bike shop has looked at it yet and haven't heard anything from the owner. The owner did say when I told him about it that he hopes the bike shop can fix it fast so I can still have some transport. Talk about "if it wasn't for bad luck I'd have no luck at all"
I cooked my car engine in September. My ex was driving me down to the shops in November to get some groceries for my son and I (I'm full time single dad) and we got hit while turning right by a P plate driver (provisional) and her car written off. I can't find the ring set for the new 20 thou pistons I purchased for my car (I put them separate to the box of pistons so they didn't get damaged because they only came in a paper sleeve) and the engineer bored the block to 20 thou, couldn't get a set of rings or pistons in that size anywhere and had to bore the block to 40 thou yesterday, the second time in one day he bored my block, to suit the 40 thou over, the only pistons he can get for my 25 year old Ford Falcon (plus paying twice for pistons, thankfully, the engineer is a friend and isn't charging me for boring the block and skimming the deck, he need a new PC and I'll be building it for him soon at cost of parts only). Did they have motorbikes in The Flintstones? I think I need to avoid mechanical things for a while! Wow, good luck with the rest of that. The only motorbikes I recall in the Flintstones were the cops!! Let us know what you find after the shop gets to your loaner. Sounds like you have a good friend/owner if he is worried about you having transportation. I'm fortunate to have a couple of good friends in both the science teacher and the engineer. I've fixed several electronic teaching aids and laptops (free) for my science teacher friend and constructed a custom aluminium checker plate aux battery box for his other bike and sidecar that sits in the frame of the sidecar (ST 1100 Honda outfit). I only charged him for material. His main transport is his Can Am, he's 60 and likes the extra stability (I'm only 2 years younger and love the sidecars and solo bikes but not so keen on the Can Am but I've only been on the back of that one). I called past the bike shop yesterday and the teenager calling himself a"a mechanic" argued with me when he said he couldn't even pull in the clutch lever. I asked if it was on the side stand and tried explaining there is a physical stopper bar which prevents the clutch being pulled in if the stand is down. I walked away muttering "if it was my bike it wouldn't be here!" Patric and bmwcoolk1200 like this. Hi, I Just reread post #1 ..It could be clutch cable starting to go bad. Right at the clutch handle the wires start braking , sometimes,.. if enough of them brake the clutch gets funky..If the barrel the clutch cable ends in is dry it bends the cable back and forth a little grease there helps a lot. Turned out the splines in the driven clutch plate were chewed out. The bike is still in the bike shop, I don't know when they will get to fixing it, they got as far as stripping it down. Bummer, That is going to add up. I put a new clutch disk in a friends K1100LT last summer. She got an aftermarket disk from Beemer bonyard ..? I think ..Anyway, it wasn't too priciy ..
A new input shaft and probably a few bearings on top of a clutch disk and all the other bits..it might add up. I have a k100lt with a new clutch of 6000 miles it has done the same when i take it apart i am told the clutch splines on both the plate and gearbox input shaft are stripped very expensive job to do. Glad it didn't happen in Italy. I'm actually somewhat shocked that this seems a common thing on the earlier K100s. Shocked that German engineering would lead to such a simple, common failure. The owner of this bike is 60, a science teacher at the local high school and he never rides anything hard. Had I owned it for some time I may have suspected I'd done to many wheel stands but the last time I even did one of those on anything (My former CBX1000 Honda prolink) was on August 15 1994, the day before my son was born. I decided that at 34 years of age with a baby son it was time to be a little more responsible and I've never lifted another front wheel since. I remember hiring a K100 back in 88 to ride up to Queensland (Australia) Expo 88 and had a ball on the 1200 kilometre ride each way. Loaded up with then wife on the back of this BM (John Player special) with full race fairing. The only issue was the engine heat in an already hot area riding in city traffic. The managing director of a company I used to manage had a K100 back in 93 and we did a lot of miles together riding , both 2 up and his K never missed a beat. I haven't heard anything yet about it but being the Christmas/New Years break the shop has been closed (service area) so hopefully they will get back to it maybe tomorrow. Yes, it is a common thing to service the splines on the early K bikes. I had to do our old K100/EML rig a few times. I remember reading about an alignment issue with some BMW bikes but not sure which ones were affected or what caused it. 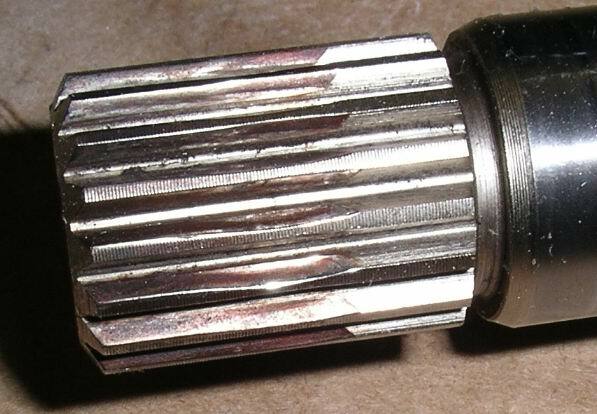 It had to do with the angle between the clutch and the transmission input shaft and would cause an odd fretting wear pattern that would accelerate a failure. Here is a picture but as I said, I don't remember which models were affected but yours could be one of them. Left alone, it could strip out from uneven load across the splines requiring both clutch and input shaft replacement. Let us know what they find when they get to it. I picked the bike up yesterday afternoon. The clutch plate was considerably worn and the internal spline all but gone. A small indication it once had teeth on one edge. While the bike was in the shop the owner dropped in his spare front wheel to replace a badly buckled front wheel (which I told him was the cause of his steering wobble). It was changed over by the shop and the mechanic mentioned he put new bearings into the wheel because the old ones were not too good. They also managed to lose a switch blank from the dash. All good, I jumped on the bike and slowly rode off up the main street of the town I live in. I pulled up and parked, rear wheel to curb outside the bank, all good. I came out of the bank, jumped on the bike and entered the stream of traffic (no, I wasn't carrying a weapon or wearing a hood, sadly, i could use the cash ). A car immediately in front (I cut in behind it) slammed on the brakes when the idiot in front of him decided he'd reverse park without indicating and just stopped and started reversing. Not a problem, I wasn't overly close to the car in front, quick application of the brakes and I'll be stopped, I was only just moving and hadn't yet raised my feet from pulling out (I don't trail my feet, ever. As soon as the bike is going they are usually on the pegs). I pulled up less than half an inch from the bumper of the car in front with the brake lever pressed firmly into the hand grip (that mark will probably stay, just like the stain on the seat (not really )). When the front wheel was replaced likely one of the apprentices (see brainless teenagers) likely did the job and never even checked. Oh well, I missed, no big deal. I'll go and bleed the front brakes before I shoot down the shops later. I have no idea how much it all cost, I considered it a rude question and didn't ask the owner (I met him at the bike shop to pick it up). The clutch and gear change certainly feel a lot better now (as expected). If I get a chance over the next few days I may take it for a 200 kilometre or so run, if I get the chance. I have my car engine fully assembled and painted and every bit of the engine bay and under the vehicle free of grease, oil and dirt and only need lift the engine in and start the nightmare of connecting all of that electronic crap. Last edited by Leo_G; Jan 5th, 2018 at 7:08 pm.